HFC-134a was a replacement for CFC-12, the ozone-hurting chemical flagged as problematic in the 1970s-1990s. But while HFC-134a won’t ruin the ozone layer and has a tenth of what the EPA calls the 10,900 “global warming potential” of CFC-12, it still worried the EPA. The final order, signed July 2, outlaws it by the 2021 model year except for vehicles exported to certain countries. However, even those exports will be outlawed by the 2026 model year. Other refrigerants which could have been used in cars but weren’t are flat-out banned as of the 2017 model year. Older vehicles can still be recharged with HFC-134a without penalty, but newer models will have to switch to either HFO-1234yf (R-1234yf), which some automakers are using already; higher-pressure carbon dioxide itself; or HFC-152a (R-152a). HFO-1234yf has a GWP of 4, HFC-152a has a GWP of 124, and carbon dioxide of course has a GWP of 1. All chemicals also fall below the 150 GWP threshold required in Europe by Jan. 1, 2017. At this point, it looks like HFO-1234yf will become the new industry standard, so we’ll discuss what you need to know to work with it properly. 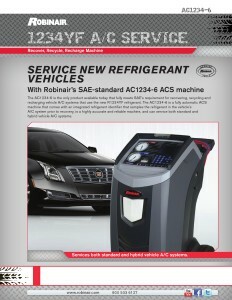 The Mobile Air Conditioning Society, the trade group for work on automotive A/C units, estimated in 2011 on its MACS Worldwide news site that new equipment for shops — including proper “Recover, Recycle, Recharge” (RRR) machines, leak detectors and refrigerant identifiers — would cost between $3,500-$6,500 or a little higher. MACS Worldwide indicated all three pieces of equipment must be dedicated to HFO-1234yf. The connections are different, there is a slight safety concern — HFO-1234yf is slightly flammable — and cross-contamination of AC chemicals would be problematic. Their combined bill estimate might be a little bit low for 2015; from a crude online search, it looks like the RRR machines alone might get into $6,500 territory. As we mentioned above, you can’t just use the one you had for HFC-134 — it must meet Society of Automotive Engineers standard J2843, and the fittings are different anyway for HFO-1234yf, according to a AC Section 609 certification manual recommended to Repairer Driven News by MACS Worldwide. The leak detectors, the cheapest part of the new gear you might have to buy, must meet SAE J2913 standards, according to the manual. There’s not much to say about these, other than the MACS manual notes you need to keep them well-maintained and take care to protect them from damage. Your shop’s refrigerant identifier probably can’t be used for HFO-1234yf, and it must meet SAE J2912 standards (or SAE J2927 if it’s part of the RRR machine). Besides the new gear, shops should understand that the new chemical costs more too. In 2011, MACS Worldwide indicated the rumored price was $40-$60 a pound; new reports, such as this 2013 one from Motor Magazine, put it at about $70 a pound. As the SAE’s Automotive Engineering magazine and the MVACS manual noted, the concern is that an unscrupulous shop would try and use the older HFC-134a or a mix of the two by trying to force a fitting or using an adapter. With a full charge, the system would behave similarly, Automotive Engineering indicated, but “global warming reduction benefits would be lost,” and you’ve just broken the law, and there could be other issues as well. A partial cheat also would be cause for concern; a 50-50 mix of the new chemical and the outlawed one would boost the pressure of the refrigerant by 8 percent, according to the SAE magazine. So if you don’t want trouble from the feds in the near-term and from the jet-ski hooligans in a globally warmed “Waterworld” in the long-term, don’t try to cheat the system. Also, be careful not to underfill the system, and certainly don’t overfill it or “top it off,” according to the EPA and the MACS manual. It’s amazing how many shops refuse to accept the factory spec, even if there’s no bulletin to the contrary. Or somehow, they have acquired this idea that a little more refrigerant should be helpful. If they’re unlucky, along with something else they do, or a part they replace, the system cools better – in the shop – than when it came in. Why is that unlucky? Because when it’s really hot and the car is slow-moving in traffic, the high side pressure goes way up and the system shuts down. Then maybe some other shop gets the job, does a recovery and recharge, and enjoys a “phantom repair” at the expense of the first shop’s reputation. Though there are a couple of areas where more caution is required, it doesn’t sounds like servicing A/Cs with the new chemical will be very different, according to MACS Worldwide. “Good system service practices will become even more important with R-1234yf systems – pulling a deep vacuum on the system to remove air, avoiding introducing moisture into the air conditioning system; both of the latter are concerns when servicing R-134a systems, and there are indications that improper service could be an even greater concern with the new R-1234yf systems,” the group’s news site states. “In many other respects, however, we are told that the new refrigerant is very similar to R-134a in performance and for service,” MACS Worldwide noted. HFO-1234yf is flammable, and the cannisters carry a red stripe to indicate this. Technicians familiar with HFC-134a — which wasn’t — should use caution. But the new chemical shouldn’t be too much of a problem if you’re careful. “However, technicians work with and around a variety of flammable materials every day including fuels, lubricants, welding gases and other materials. Common sense and safe shop practices can greatly reduce any hazard from this gas,” the MACS manual states. Despite Daimler’s complaint, automakers already use the new refrigerant. In a September 2014 post following an interview with a Honeywell executive, MACS Worldwide technical editor Steve Schaeber indicated that HFO-1234yf ranks include more exotic cars like the BMW i3 and Tesla Model S as well as mainstream standards like the Chevrolet Malibu, Jeep Cherokee and Kia Optima. Check with OEMs of course if you’re unsure or can’t tell despite the fittings and the refrigerant identifier.